Bangalore is a promising market for commercial real estate. With more than 1 lakh job opportunities raised in the city every year, the scope of appreciation in both capital and rental markets seems high. Bangalore, the Silicon Valley of India and a bustling IT hub continues to have a robust demand for office space from the IT/ITeS sector and new start-up firms. Interestingly, Bangalore registered the highest number of start-ups over the past few years, thereby reflecting the city’s strength in dynamism and influx of venture capital funding. As per Colliers International (India)'s Office Property Market report, the first quarter of 2016 witnessed over eight mn sq ft of total office space consumption across nine major cities, where Bangalore, Delhi NCR, Pune and Hyderabad emerged as the key markets. Bangalore is estimated to have contributed about 33 per cent share, retaining the top position. According to research by Colliers International (India), the total office space absorbed by Bangalore in the first quarter of 2016 was as high as 2.65 mn sq ft. IT/ITeS (includes technology start-ups and E-commerce giants) continues to be the driving force behind such an enormous demand, apart from BFSI which comprises only 6 per cent share in the total demand. The demand can be attributed to factors such as expansion, relocation, consolidation and emerging entrepreneurs. Amongst the various areas in Bangalore, the Sarjapur-Outer Ring Road (ORR) stretch emerged as the most preferred location by corporates. The demand for high intake can be ascribed to elements such as easy access to Central Business District (CBD) and airport, availability of large land parcels and enhanced social infrastructure. The area still accounts for a large volume of unoccupied space which should be operation in the coming months. Due to the emergence of co-working spaces, Koramangala and HSR Layout have been an attractive destination for numerous start-ups. Other areas such as Electronic City, Whitefield and Marathahalli have saturated in terms of availability of office space and do not attract much traction. As per findings of Colliers International India's report new inventory has augmented every quarter and stands at about 1.96 mn sq ft. One of the major projects completed recently is a tech park of one million sq ft on Sarjapur Road. Other locations which observed high office space supply include Whitefield, Bannerghatta Road, Electronic City, Hosur Road, Jayanagar, and Kanakapura Road. Leasing of office spaces in Bangalore is largely driven by IT/ITeS companies. However, last year witnessed a large volume of space being absorbed by e-commerce and manufacturing firms. The same trend is expected to continue this year too, primarily because of the presence of established educational institutes and city’s cosmopolitan environment. Government’s policy schemes such as Digital India, Skill India, and Make in India are other factors contributing to growing demand for commercial real estate and hence will be critical for the development of city’s business environment. Increasing investments in Bangalore’s infrastructure such as the metro and rapid bus transport system along with the rise in Foreign Direct Investments (FDI) has led to a strong economic growth in the city. This trend is expected to continue and make Bangalore one of the most desirable cities to live and work globally. The growth has also led to the enhanced construction of office and residential market and appreciation in the rental market. Bangalore, accounts for 1, 00,000 lakh IT jobs every year. Therefore, it is considered as one of the most promising markets in the country for commercial real estate. The economic outlook of the city looks strong with many investors eyeing to invest in the residential and office sector. As we already know that India has become an established outsourcing market for many multinational companies which is regarded as another key reason for sustained office demand. Author's Note: The author possesses a Master’s Degree in Marketing and Advertising from University of Leeds, UK. 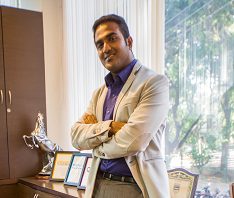 He represents the ‘Generation Next’ at Concorde and follows the mantra of ‘business existing for the customer'.